So I see you’ve found your way here from part 7! Now, we can continue to delve further into the Project Header by looking through our Sharing, Privacy and Subscription Options. 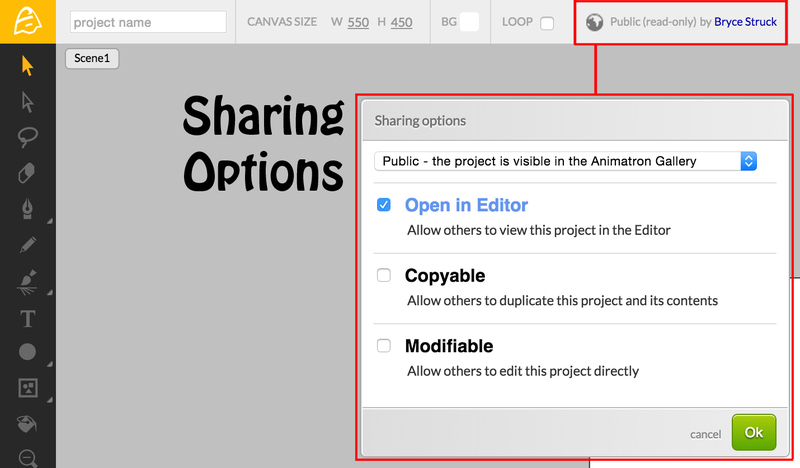 Using the Sharing Options is a great way to manage who gets to view, access and edit your project. The original project author’s account name is shown here also, so you know who first generated the project. This is great for when multiple people have viewing and editing access. Clicking on the globe icon, you are met with a pop-up window that contains your Sharing Options. The highlighted checkboxes allow you to make your project Viewable, Copyable and even Modifiable to others who have access to it. Selecting the uppermost menu within your Sharing Options, grants you the option to allow others access to your project file. The Public setting makes your project visible in the Animatron Gallery. The Unlisted setting only allows others access once you send them a direct URL link. The Private setting makes it so only you can view and edit the project. Certain projects are restricted by limitations set by your Subscription Plan. Let us see what the differences are per subscription. There are currently 3 subscription plans, quickly accessible from the Project Header, each allowing unique access and project control options. Clicking on the Subscription Type, shown in the blue (Pro) text above, opens a new browser window, allowing you to see your subscription options before making a selection. The 3 Subscription Plans, depicted above, provide you with various account options. Simply logging in to the Animatron website provides you with the Free Plan, specifically meant to introduce you to the capabilities of the Animatron Editor. 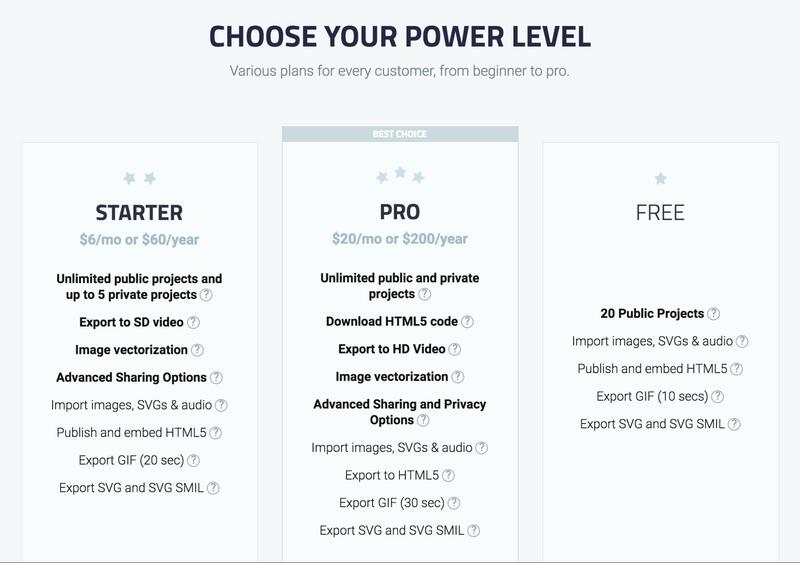 The Starter Plan allows for standard quality video exporting and image vectorization, good for up to 5 private projects. The Pro Plan provides the best deal for your dollar, useful for generating high-definition videos and securing them with unique privacy options. Unlimited private projects makes the Pro Plan the best option for users with continued use in mind. With the unique flexibility of the subscription plans in mind, we can move forward and review our Publish Settings in part 9. We have covered a great deal about the 3 current subscription plans and the Sharing and Privacy Options that can be utilized within each plan. So let’s move onto part 9 and take a look at the final options the Project Header has to offer, the Publish Settings.